When it rains, it pours here. In the course of 5 days, we have three birthdays. This year all the birthday kiddos are celebrating their first or second birthdays. 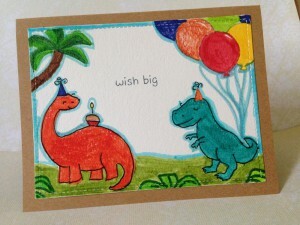 This card is for little boy who is turning one today. Extra Details: I started with a panel of water color paper that I die cut with a stitched rectangle die. I stamped my scene in grey ink. I used post it notes to make masks for the birthday hats and balloons. I used Crayola markers to color the scene. I wanted brighter color than I can get with colored pencils. However, I am not good at creating shading with the markers I have. I adhered the panel to a kraft card base and was done. One of my husband’s cousins is getting married in a few weeks. 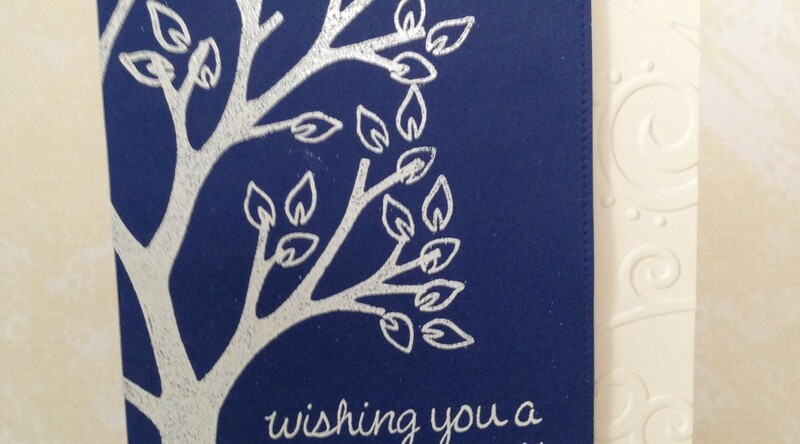 Her wedding invitation was dark blue with a white tree on it. As soon as I saw it, I knew exactly how I wanted her wedding card to look. Extra Details: I started with a dark blue panel. I trimmed it to 5.5 x 3.25 inches. I added some detail to the right edge with the Stitched Border dies. Then, I stamped and heat embossed the tree, leaves, and sentiment. I used white embossing powder. I wanted to give the card a little something extra, so I dry embossed the card front with a Darice embossing folder. I popped the blue panel up on fun foam and was done. One of these cards was featured on Lawn Fawn’s Fawny Flickr Friday. It was one of two of my cards included. 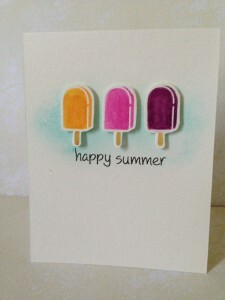 I just watched Kelly Latevola make four really awesome popsicle cards on Simon Says Stamp’s Blog. 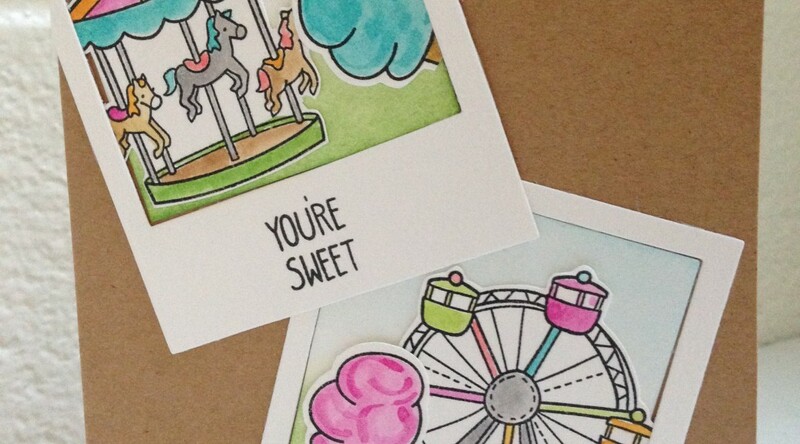 Although, I do not own the stamp set or Copic markers that Kelly used, I knew I needed to try to make some popsicle cards of my own. They just screamed summer to me. 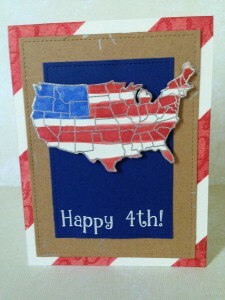 My Fourth of July card. This one is also my favorite of the four. Kelly Latevola used Copic markers to create Rocket Pops and I loved them. 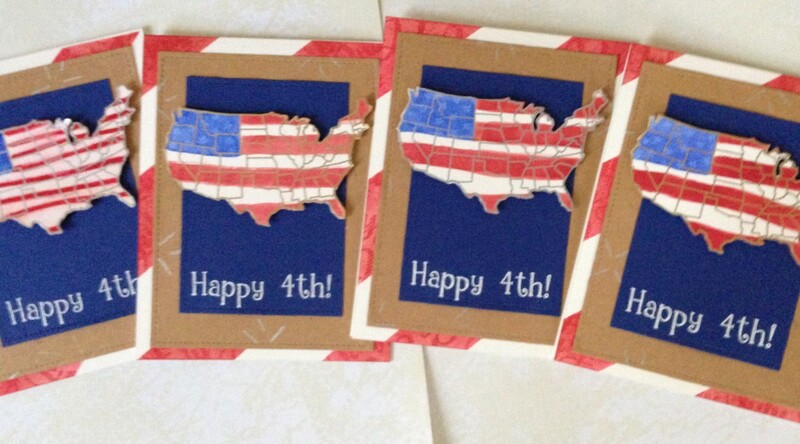 I also just finished making a set of Fourth of July cards and was still feeling patriotic. I used Blueprint Sketch for the blue part of the pop. I don’t own a true red Distress Ink, so I blended Fired Brick and Pick Raspberry together. I thought that combination worked quite well. I put a lot of ink at the far ends of the popsicles and used clean water to help blend the colors into white in the middle of the popsicles. 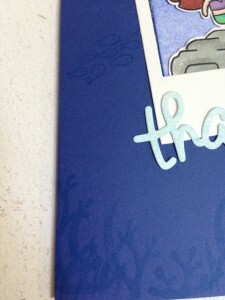 After fussy cutting out the popsicles, I ink blended some Tumbled Glass and Mermaid Lagoon on the card base. I stamped a custom sentiment in black ink. I used DIY foam squares to pop up the popsicles. 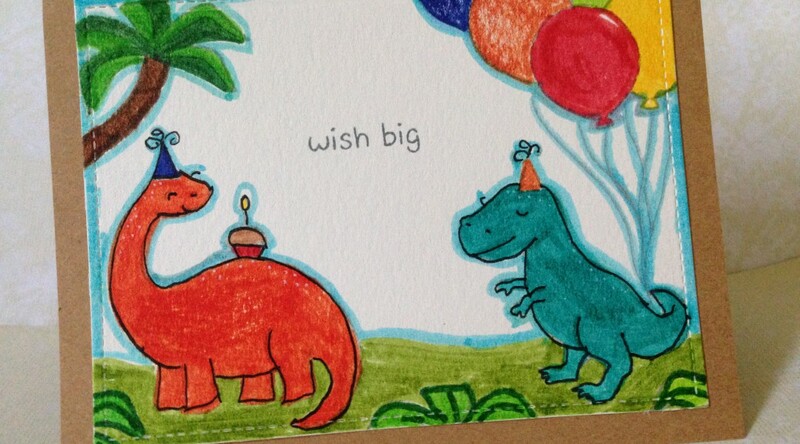 This was the card featured on the Lawn Fawn Blog. This is actually the last set of popsicles that I water colored. I only had two popsicles left and a bunch of ink on my pallet still, so I decided to make multi colored pops. I used three colors per popsicle and tried to keep colors that would blend well next to each other. I fussy cut these out as well. I was a bit tired of using blue behind all of my popsicles, so I switch to Abandoned Coral. I used a sentiment from Best Pun Ever and black ink. I popped the popsicles up on DIY foam squares for dimension. I made this for my best friend and her family. I used their favorite colors for the pops. I definitely owe my best friend and her family a card. I haven’t sent one in over a month. 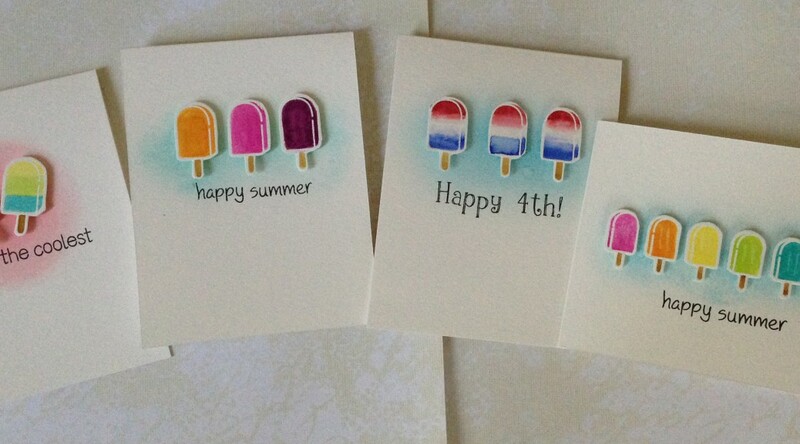 They currently live outside of the USA and would not receive a Fourth of July card in time, so I started thinking about summer cards. 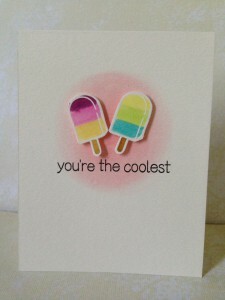 Once I had all the popsicles stamped, I knew that one of these cards would be for them. I water colored one popsicle in one family member’s favorite color. Once they were dry, I fussy cut them out. I ink blended some Tumbled Glass Distress Ink on the card base. I used a sentiment from Happy Summer with black ink. I popped the popsicles up on DIY foam squares for dimension. A rainbow of frozen goodness. I had six little popsicles, so I immediately thought rainbow. After the Distress Ink dried on these, I added some lines of clean water to lift the ink away. I was trying to create the look of the indents that some popsicles have. After fussy cutting the popsicles out, I ink blended some Tumbled Glass Distress ink on the white card base. I used sentiment from Happy Summer in black ink. I popped the popsicles up on DIY foam squares and was done. 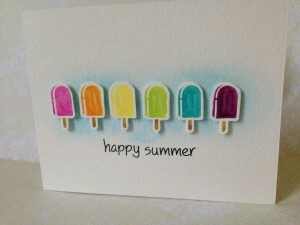 Extra Details: I started by stamping and white heat embossing all of the popsicles. I was using scraps of water color paper, so I stamped until I ran out of room. Using my Distress Inks, I added color to all the pops. At this point, I started thinking about card layouts. I wanted all the cards to be clean and simple cards with the popsicles being the main focus. I used white card bases for all the cards. The details for each card are under the picture. I found this retired Lawn Fawn set on Amazon and couldn’t resist buying it. I love the sentiments and the images are perfect for masculine cards. Extra Details: I started by stamping and water coloring my images. I used Distress Inks. Once everything was dry, I fussy cut out all of the images. I created my card base out of kraft cardstock. It was looking a little plan so I added some interest with the Interlocking Backdrops Stamp set. I was particular about getting a perfectly stamped image. As I was playing around with the placement of the main images, I decided I needed a strip of cardstock to ground the images. I decided on dark blue. I adhered everything flat to the card base. Fourth of July is coming up fast. I also recently bought the Wish You Were Here stamp set. I wanted to make something patriotic with it. I ended up with four cards. 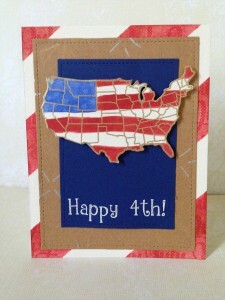 Extra Details: I started by stamping and heat embossing the continental USA on water color paper. I used gold embossing powder on two of the images and silver embossing powder on the other two. 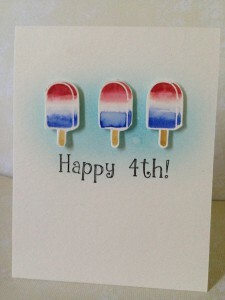 Using my Distress Inks, I water colored the images in the style of the American Flag. I do not own all of the Distress Ink colors, so I had to get creative on my red stripes. I mixed Fired Brick and Picked Raspberry in the hopes of getting a truer red. I think it worked out fairly well. I tried one with thinner red strips but didn’t like the way it looked. After the Distress Inks dried, I added white stars with a white pigment ink on the blue area. Then, I carefully fussy cut the images out. Next, I prepped my card bases. After scoring and folding the card bases, I masked out some stripes. I started by stamping the word July in red ink in all the open areas. I then ink blended over the top of the words. It created some really cool texture. After the card bases were dry, I started assembling my cards. I die cut two layers for each card; one from kraft card stock and one from navy blue card stock. 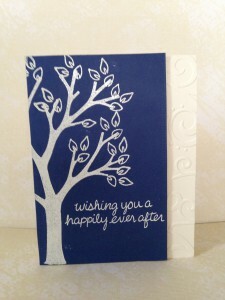 I stamped and white embossed the sentiment on the blue layer. I wanted a little bit of texture on my kraft layer, but was having a hard time figuring out what I wanted. I, eventually, settled on using the vein stamps from Rooting for You as fireworks. I stamped them in metallic pigment inks. They are very subtle but in person they add that little something extra. I adhered the layers flat to the card. I did pop the USA map up on DIY foam Squares for a little dimension. I realized this morning that I needed a birthday card for a sweet little two year old girl and I needed it in a few hours. This is the card that I made. Extra Details: I started by stamping everything on the white panel. I used post it tape to mask off the birthday hats, balloons, and gifts to the feel of dimension on a flat panel. I used Simon Says Stamp Smoke ink to give everything a softer look. 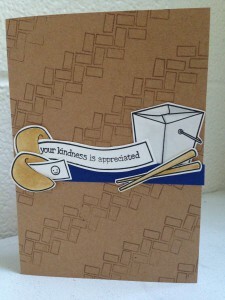 I stamped the sentiment in Simon Says Stamp Slate ink to help it stand out a bit. I colored everything in with colored pencils. I added a few details with my gold and silver gel pens. I noticed the lower left corner was a bit bare so I added some greenery. Next I prepped my card base. I knew my card base would be much bigger than my panel so I did some tone on tone stamping on it. I also added a thin pink frame I had left over from another project. 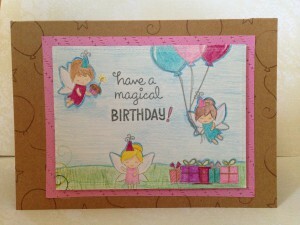 I had used the Stitched Border Dies to add detail to the pink paper. I popped the white panel up on fun foam and adhered the frame around it. I am really enjoying using the Say Cheese die. 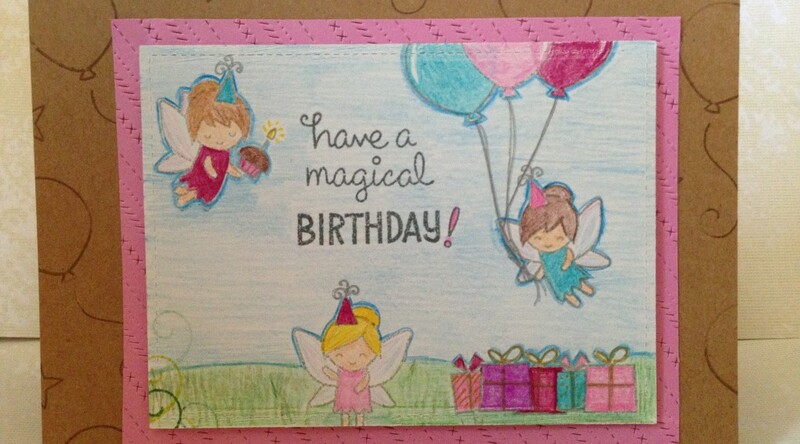 It makes it so easy to make a card; a few images, some background stamping and I’m done. 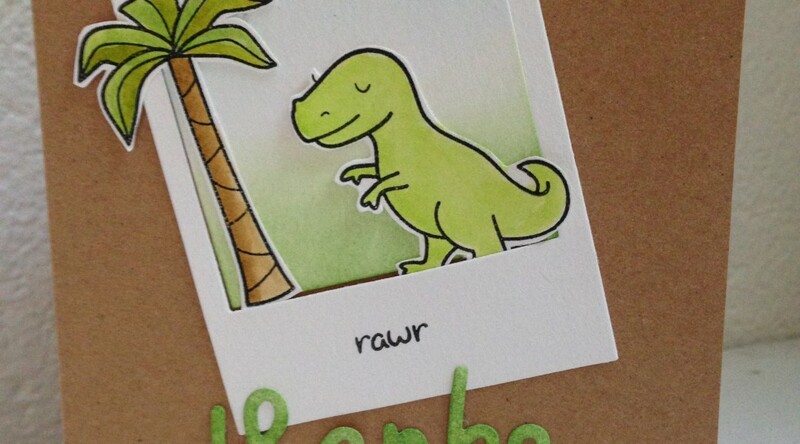 Extra Details: I started by stamping and water coloring the dino and tree. I used Distress Inks. I fussy cut the images out once they were dry. After cutting out the Polaroid frame I added some ink blending to the inside square to make a background. I also die cut a Scripty Thanks. I added color to that with Mowed Lawn Distress Ink. Then, I began the stamping for the card itself. I added a sentiment to the Polaroid frame. 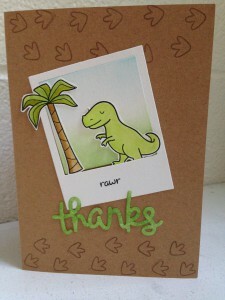 I also added some dino tracks to the card base. Lastly, I adhered everything to the card base. I got my hands on the new Mermaid for You stamp set. I am still really enjoying using the Say Cheese die as well, so I combined the two. 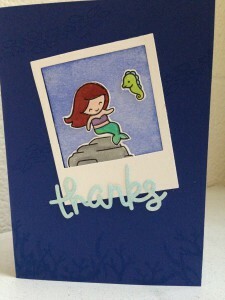 Extra Details: I started by stamping and water coloring the images from the Mermaid for You stamp set. I used my Distress Inks to water color. Once dry, I fussy cut all the images out. I die cut a Polaroid frame from water color paper. I ink blended some Blueprint Sketch Distress Ink on the inside square, and then adhered the mermaid images on to the square. As I was playing around with the placement of the frame, I decided that background needed something. I opted for a tone on tone stamping so as not to distract from the main images. I used more images from the Mermaid for You stamp set. After adhering the frame and inside square, I added a die cut Thanks. 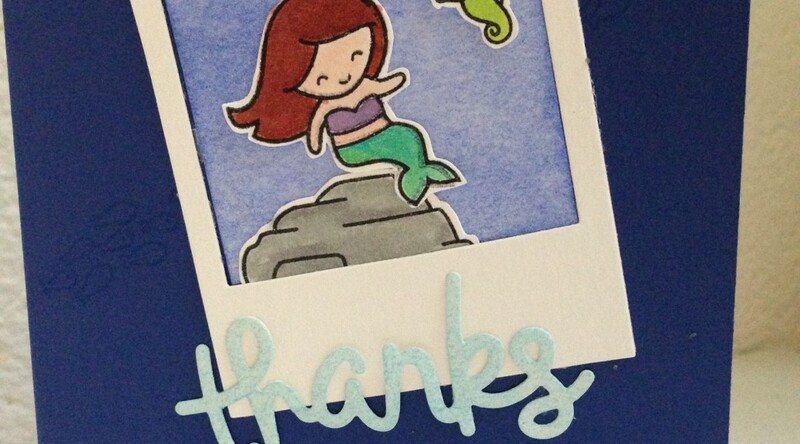 I colored the Thanks with some Salty Ocean Distress Ink. 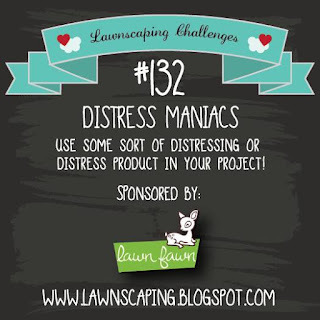 I am entering this card in the Lawnscaping Challenge #132 Distress Maniacs. 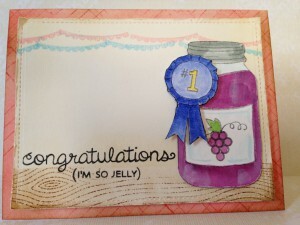 When I saw the So Jelly stamp set, I immediately wanted to make a jelly jar at a county fair to go with the sentiment. I was originally planning on going with strawberry jelly because I have a strawberry stamp. 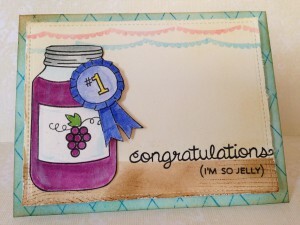 Then I saw this challenge and knew I would have to go with grape jelly, to match the Seedless Preserves Distress Ink. I made two cards so that I could play with colors as I made the card. Card one. I used black ink to stamp the jar and ribbon on this card. I also used Salty Ocean Distress Ink on the background. Card two. I used second generation stamping to stamp the jar and ribbon to get a lighter of outline. I also used Abandoned Coral Distress Ink for the background. 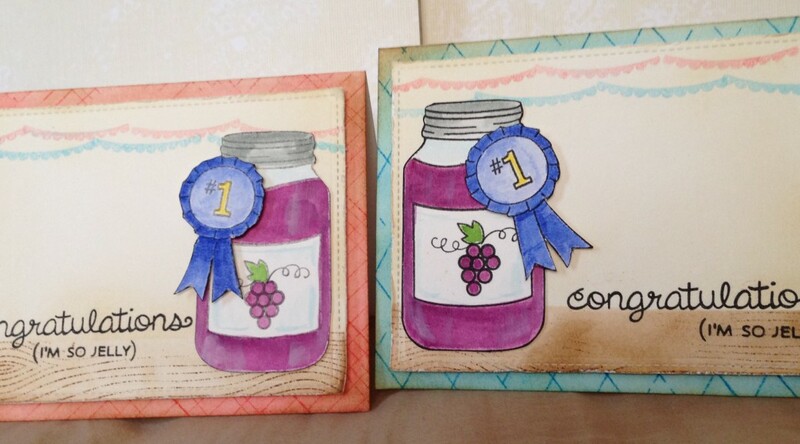 Extra Details: I started by stamping and water coloring the jars and ribbons. I used Ready Set Snow and So Thankful stamp sets to make the grapes. I water colored everything with distress Inks. I watered down some white acrylic paint to give the jar the look of glass. After everything was dry, I fussy cut out the images and painted the edges with a black marker. I die cut a stitched rectangle for the main panel from water color paper. I ink blended some Antique Linen and Vintage Photo Distress Inks for the background colors. I used the Vintage Photo ink to stamp the wood grain pattern. I added some banners with Salty Ocean and Abandoned Coral Distress Inks. 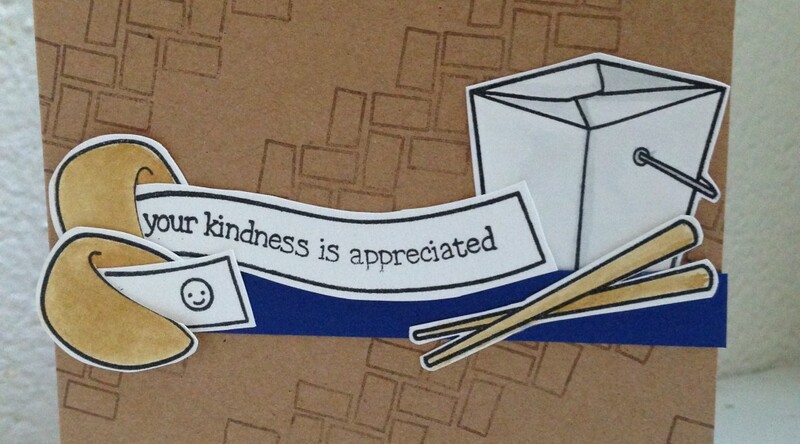 I used the third generation stamping to help the banners blend better with the background. I added the sentiments in Versa Fine black ink. I used a steak knife to distress the edges of the panel. I adhered the jar down flat to the main panel. I popped the ribbon up on DIY foam squares. For the card base, I used water color paper as well. I ink blended the edges of the front in either Abandoned Coral of Salty Ocean Distress Ink. 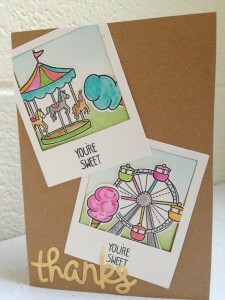 I stamped some texture with the same ink color using School House Backdrops stamp set. I added some Antique Linen and Vintage Photo Distress Inks on top to tone the brighter colors down some. Lastly, I popped the main panel up on fun foam and adhered it to my card base. I just bought the Say Cheese die and Admit One stamp set, so I had to play with them. Extra Details: I die cut the Polaroid frames from some white card stock. I saved the inside square and ink blended a bit of Distress Inks to create a background. I stamped the images on a sheet of water color paper and used Distress Inks to add color. After fussy cutting out the images, I adhered them to the background pieces. I should have paid attention to the placement of the inside squares, because they didn’t fit back exactly. I stamped a sentiment on the frame and adhered them to a kraft card base. I die cut the thanks from the same white card stock and used a gold pigment ink to color it. I adhered the thanks down and called it a day.